Hesychasm is a prayerful life, a life with love; at the same time, it is a mystagogical and liturgical life in which, following one’s purification from the passions, one attains a profound experience and taste: the vision of the glory and grace of God. It is not simply a means of preparation for prayer, as Barlaam had initially thought and even certain ignorant monks had explained, in which one must press one’s head to the chest, follow one’s breathing, and gaze at one’s navel. That is nonsense, and St. Palamas criticized it. Of course, it is essentially to become focused, but this is not meditation. It is not meditation, but a deepening in prayer, so that the mind would descend into the heart, which is the depth of man’s being. As the Savior said: "For out of the heart proceed evil thoughts" (Matthew 15:19). The heart is the whole of a person. "A man shall draw nigh, and the heart is deep" (Psalm 63:7, LXX), says the psalm so briefly and concisely. Therefore, if one prays only in one’s mind, this prayer will be superficial, despite the fact that the mind is a profound organ of the human person, of his soul. But only when the mind is united with the heart can it function properly. Such is the connection of the organs, of the psychophysical constitution of the human person. This is how Palamas and the hesychast Fathers spoke about this. There is a homily on prayer attributed to St. Symeon the New Theologian that does not in fact belong to him. There it speaks of attention (prosochi) and prayer (prosefchi). Efchi means supplication or prayer, and pros means to approach, as for instance in “to step” [stupit’] and “to step up to” [pristupit’]. It is the same with prosefchi. And prosochi also has the meaning of being close to something, of attention to something or someone, of being close to him. We are arriving at the most important point. What is salvation? It is union with God of the closest and most intimate kind, just as Christ united more than closely with the seed of Abraham: "He also Himself likewise partook [paraplisios] of the same" (Hebrews 2:14). Plisios is “near,” and plision is “neighbor.” But paraplisios is even better, even more than simply a close partaking in body and blood. We attain the closest participation when we receive Communion. In the prayers it says: “Christ! O Wisdom, Word and Power of God! Grant that we may more perfectly partake of Thee.”  “More perfectly” means more truly, deeper, more participatively. This, too, is what paraplisios means. Thus, we unite with God. But what kind of union is this? According to essence? Then we would disappear; it would be pantheism and we would cease to exist. God is that mighty in His essence. It would be as if we threw a small crumb of bread into the fire or a drop of water into the ocean. What will happen to them there? Therefore it is not a union according to essence. Hypostatic union in our nature takes place only in the Person of Christ. We unite only with the energy of God, thanks to Christ’s hypostatic union: He came to us and became the mediator [mesitis]. “Intercessor” [khodatai] is not entirely exact, because an intercessor goes between two people, as I understand this word. “Mediator” [posrednik] is also an “intermediary” between two people. But the Fathers (for example, Nicholas Cabasilas at the time of St. Palamas) say that it is as if a third person took two people and united them with himself and they became linked, becoming one. This is how Christ, as Mediator, united God and man in one. This means that everything is woven and filled with light: this light is Divine grace, God’s love, Divine energy – and this is what the Apostles saw. What is also important is that one can see this light even with one’s bodily eyes, albeit partially. 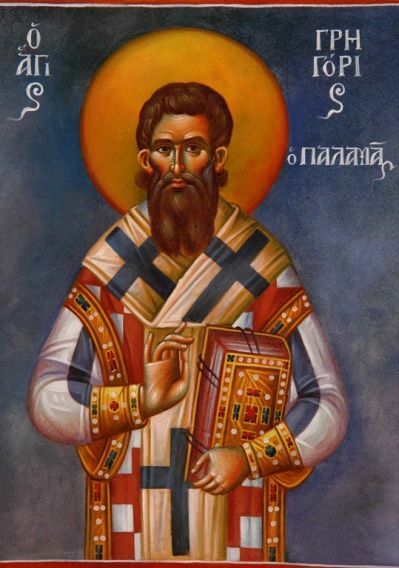 Palamas cited this from the troparion: “When Thou wast transfigured on the mountain, O Christ our God, Thou didst show Thy glory to Thy disciples as far as they could bear it” – that is, as far as they could see it. But their eyes were also transfigured from within, so they could receive the Divine light. Of course, the same thing happened with us Serbs. Enlightenment is always superficial. Barlaam said that this is the light of the mind. There was some kind of enlightenment, some kind of inspiration – but it was all created. Of course, secular knowledge is good, too. Fathers such as Basil and Gregory first studied in secular schools – just as Palamas later studied in Constantinople –and then went on to the Divine school. That is, this light is also good, but it is not essential – even if it can be useful. St. Gregory the Theologian said: “It is foolish to fight against knowledge.” Only foolish people want everyone to be like them, saying that one does not need to study. Sometimes one hears the same thing among monks: that one does not need to study in school, that one can become holy and enlightened without such study. But the one is not opposed to the other; what is important is which is given priority. This is the realism of the Orthodox experience, which is shown by the theology that has disclosed and justified it. This has always been the case in the history of the Church, as Fr. Georges Florovsky said: theology discloses and justifies that by which the Church already lives and which it already possesses. Nothing new has been invented in our faith; it is the Pope who is always coming up new dogmas, resulting in great difficulties. If the Mother of God was conceived immaculately, then there is no sin – so then why did She die? The Pope, who affirmed the dogma [of the Immaculate Conception] in the nineteenth century, afterwards spoke of Her ascension, of Her assumption into heaven, without mentioning death: instead of “She died,” he said: “the Lord took Her to Himself in heaven.” But we believe that She died and that after a certain time the Lord took Her to Himself before the [general] resurrection. But inasmuch as I understand the Fathers, she, too, will be fully resurrected at the general resurrection. She is with the Lord: this is the mystery of the Mother of God, a sort of foretaste of the Kingdom and Resurrection. Just as, for instance, although the Lord had not yet undergone the Passion at the time of the Mystical Supper, He shed His Blood and gave Communion to the Apostles – which was a real Communion, a foretaste, a pre-suffering. In Communion we partake both of the suffering Lord and the Risen Lord, since these coincide. But He offered the Mystical Supper before His suffering: “Take, eat: this is My Body, which is broken for you” – but it had not yet been broken. Gregory of Nyssa says that the Lord wanted to demonstrate that He was going voluntarily, and not because of the malice of the Jews or the judgment of the Romans. And when Peter tried to turn Him aside, in Matthew 16 – the same ardent Peter who had said: "Thou art Christ, the Son of the living God" – the Lord replied: "Get thee behind Me, Satan" (Matthew 16:23). The Pope should know that the Lord said this to Peter even after his confession. Moreover, Peter later denied the Lord and had to be restored to his apostolic dignity by threefold repentance. The Pope did not speak of himself in this way. There was a Greek, Photios Kontoglou, a good writer from Asia Minor who became a refugee in Greece and a fine iconographer, who wrote an article in which he said: “Why did the Pope choose the Apostle Peter as the patron for his infallibility? If he had spoken of some Apostle who might not have sinned, then this might still have made some sense. But Peter made 300 mistakes” (nkafes refers to when a child is making mischief). Of course, the Lord chose Peter as His foremost disciple, but always as equal to the others, since Peter was a human being, understood human weaknesses, and was indulgent to others. If He had chosen an angel, St. John Chrysostom says, the angel would not have understood someone who sinned once, twice, three times, seven times, seventy-seven times. The angel would have had enough! In is recorded that the following marvelous event took place on the Holy Mountain of Athos in the sixteenth century. There was a sinful man, a poor thing, who had a weakness of the body; he renounced it many times, beseeching God that he would not sin. He went to church, wept, made promises to the Savior, and then left – and once again sinned, and once again returned. This went on for a long time. Once, many years later, he came and wept before the Lord, repenting: “O Lord, help me; I will stop!” Suddenly the devil could stand it no longer, and said to Christ from the porch of the church: “That’s how You are; You don’t understand a thing! This one swears and weeps to You while he’s here, but as soon as he leaves he’s mine and will do whatever I want. Why do You put up with him?” Then the Lord answered from the icon: “Why do you come to him when he is Mine? I do not bother you when he is yours. I accept a man in the condition in which I find him.” And at that very moment this man died. This is how the Lord took him. Such is the Lord’s patience! The Stoics also said that one needs to attain apatheia, to put to death all one’s feelings and movements. The Buddha said the same thing: that the principal evil is the thirst for life, and that this needs to be renounced. Not just thirst for physical or spiritual pleasure – no, life is evil, it needs to be renounced! This is terrible! Fr. Justin said that Buddhism is the maturity of despair. Palamas said to Barlaam (not, of course, referencing the Buddha) that our ascetic struggle is not to reach apathy, not to kill everything, but rather to offer a “living sacrifice” to God in all things. The cleansing and subduing of the passionate capacities of the soul and body is essential. One needs to turn them towards God: God gives us these capacities for us to live by means of them. One needs to offer a living sacrifice pulsating with eternal life. Here is a commentary. When I read the following, I saw why Orthodoxy is always joyful. Many say that one needs to mortify oneself, become “dead” – but this is hardly possible to do. It is impossible when grace is present, for grace gives life. Ignatius of Antioch is going to his martyrdom – he is already an old man, nearly eighty – and says: “I hear the sound of living water; I hear a gurgling brook that says: ‘Come to the Father.’”  And this is an old man of eighty! This is what Orthodoxy is. Ascetic struggle consists not of mortification, but of purification from mortality. Sin is mortality and perishability. As the Apostle Paul put it at the beginning of his apostolic labors, we need to turn from dead works to the living God (cf. Hebrews 9:14; 6:1). Saul could not have become a Christian, could not have become the Apostle Paul, until Saul had died. When Saul died and rose in Christ as Paul, everything that had been good in Saul was given enormous potential; it blossomed and realized its full significance. Palamas put it this way: the deified man becomes infinite, eternal, immortal, and even – and here he is repeating Maximus – beginningless! There is a paradox for you! Man’s existence has a beginning, but it does not have an end, like a geometric ray that begins at one point and goes on infinitely. But Palamas says that one can also become beginningless – how is that possible? He simply enters the eternal course of the Divine life: that circling, inclusion, or perichoresis, that is the mutual indwelling of Divine life. Therefore one becomes encompassed within this life, is nourished by this life, and lives in this life, which is beginningless. In this sense, deification is the grace that one receives, as the Apostle Paul said: "I live; yet not I, but Christ liveth in me" (Galatians 2:20). Palamas is a theologian who reinterpreted all of Holy Scripture, as our Metropolitan Amfilohije said in his fine study of Palamas’ triadology ; it is a renewed interpretation of Holy Scripture. He neither changed nor rejected anything; he truly had such a gift from God. This all happened before the great suffering of the Orthodox that took place five centuries later, and therefore we survived in part thanks to hesychasm. 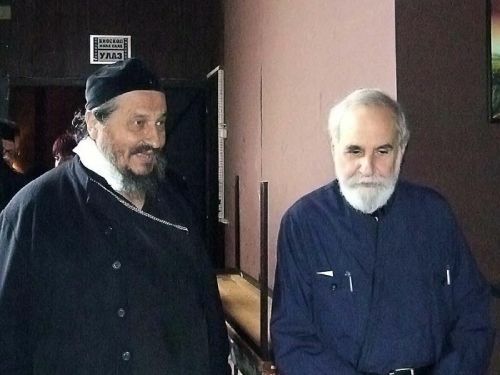 I believe, as St. John of Kronstadt and others have said, that the Russian Church survived its terrible suffering thanks to the blood of the martyrs. God will not leave us; He will give new holy people in the future as well – one only needs to believe in God and in the Church. Yesterday we called to mind Tyutchev: “Russia cannot be understood by the mind… one can only believe in Russia.”  So, one must believe in Holy Russia and in Orthodoxy! An album of his iconographic and artistic work, along with a number of his essays, exists in English: In the Mirror (Sebastian Press, 2007). Yannis Makriyiannis (1797-1864) was a hero of the Greek struggle for independence, achieving the rank of general. Today he is best known for his Memoirs, a monument of Modern Greek literature written in pure Demotic Greek. Cf. Letter to the Romans, 7:2. Tajna Svete Trojice po ucenju Grigorija Palame, 1973. From a four-line poem (now become proverbial) written by the great Romantic poet Fyodor Ivanovich Tyutchev (1803-1873) on November 28, 1866.